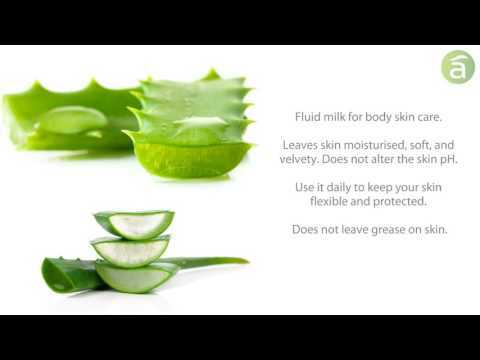 Fluid body milk based on pure Aloe vera from organic farming. Body care. For daily skin care. Leaves skin soft and moisturized. It does not alter the pH, it is absorbed quickly. With avocado and Helianthus oil, rich in essential fatty acids. Great moisturizing and regenerating capacity of the tissues. Avocado oil: Nourishing, source of vitamin E, emollient. Rich in essential fatty acids(oleic acid, linoleic and linolenic), high capacity moisturizing. AHelianthus Oil: Rich in essential fatty acids. Apply once or twice a day over the whole body, especially after bathing, massaging gently until it is totally absorbed. Precaution: Avoid eyes contact.